While food reviews keep me constantly satiated and on-the-go, there are some outlets that merit repeat visits. Stan's Assam & Garam at One Bangsar is one of them, thanks in no small measure to Stephanie Saw. Her inherent passion at churning out excellent Malay dishes, albeit with slight twists has caught the imagination of many discerning foodies and their support have probably keep her going. Nevertheless, these are challenging times for those in the food business. With everyone feeling the pinch, it is good to know all the owners whose outlets form the One Bangsar food haven have collectively came up with a unique promotion that is akin to a mini gourmet safari. At the unbelievable deal of RM28 nett per person, diners can meander along the whole row of fine restaurants in One Bangsar and eat to their hearts' content each Saturday in August. It's a clever concept that quickly caught local food lovers' imagination. Despite the afternoon heat, more than 150 diners gamely showed up to savour the spread laid out by the ten outlets. We had a great time wandering around and sampling the eclectic mix of Vietnamese, Mediterranean, Italian, Indian, Malay, French, Japanese, Chinese and Thai specialities with refreshing drinks thrown in. While it is a good way of creating much awareness amongst new customers who have yet to discover One Bangsar, remember that it is not totally fair to judge each outlet based on the limited menu they serve up on these occasions. It merely acts as a sneak preview of each outlet's promising, delicious secrets that hopefully will induce return visits. Of course, hiccups are not unusual for outdoor events of this kind. Firstly, there are too few seats compared to the large number of people - it would have been better if the organisers dispense with formal table seating entirely and just provide adequate seats instead by using portable stools. And for the price of RM28 nett, there are bound to attract quite a few ugly Malaysians who are all out to get their money's worth. That's right, these people never even blink an eye by grabbing and piling up all the food on their own plates the minute it's dished out. Never mind if they can't put it all away and others have yet to get a tiny helping. Outlet managers and owners too must be conscientious enough to speed up their food replenishment and ensure the interest of paying customers are well looked after, especially when the food is in the process of being prepared or had finished. It's unthinkable of asking diners to return again and again or plead with them to move on to other outlets first. For one, we did move to other outlets and after returning twice just to be disappointed with a rather curt brush-off, we just gave up and walked off. What are the chances of that outlet getting our patronage in the near future? Well, don't hold your breath for this. Undoubtedly the idea of this moveable feast is filled with superb potential so it'd be a shame if more shortcomings overwhelm the benefits. But each event is a learning experience and I do hope the One Bangsar team will gain invaluable experience and lessons from it. 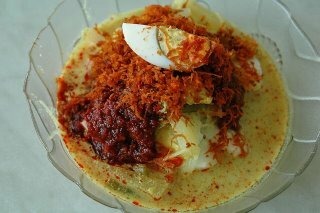 Longing for Lontong? Here's your solution! Let’s face it – with the cost of city living keeps creeping up, ardent foodies are forced to dig deep into their pockets and find ways of stretching their hard-earned ringgit. Fortunately in Malaysia one does not have to look too hard or too far to eat well at budget prices. Street side hawker stalls and informal no-frills eateries abound so local food lovers can still afford to feast like a king on pauper’s prices. Here’s some of my favourite haunts for simple, cheap and tasty eats. This little nondescript stall used to be at the sidewalk across from Fortuna Hotel but has since relocated into a narrow shoplot just across from DBKL’s Little Ain Arabia. The stall still reigns supreme in my book as the gold standard for parn mein, flat flour noodles which I reckon is Chinese-style pasta. Here diners have a choice of the chewy noodles in thin, stringy texture like wantan mee or the flat fettucine type. You can opt to have it served in a delicious ikan bilis (dried anchovies)-based broth with sayur manis and a splendid topping of crispy fried ikan bilis, minced pork, sliced black mushrooms and wood ear fungus. Better still, try the kon lou version where the noodles are tossed in thick, black caramelized sauce. Don’t miss the stall’s ‘killer’ sambal belacan dip. Bouncy fish or meat balls can be added at extra charge. Prices from RM4.50 onwards per plate. You won’t get enough of this incredibly tasty dish. The ensemble comprises diced nasi impit (pressed glutinous rice) in a piquant turmeric and coconut gravy filled with long beans, shredded radish, tempe (fermented pressed beancurd cake), strips of fu chook (beancurd sheets), hard-boiled egg wedges, beancurd, sliced cabbage and glass vermicelli. Spicy fish serunding, chunky peanut gravy and a dollop of sweetish sambal add the finishing touches to this superb dish. Other irresistible specialities served here include soto ayam and nasi lemak. Both the lontong and soto cost RM2.50 per plate while nasi lemak biasa costs RM1.00. Side dishes of fried chicken, beef rendang and sotong sambal available at extra charge. You can’t miss this little stall in front of the 7-11 store, just one lane behind the YMCA building. Run by a husband and wife team, they are kept busy quenching their multi-racial customers’ thirst for fresh coconut water, cendol, cincau but nothing beats their fantastic ABC or ais batu campur. 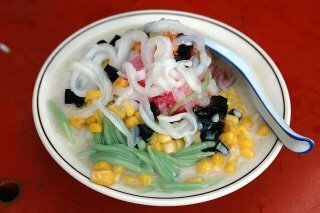 Regulars nickname their Special ABC (RM2.50 per bowl) the poor man’s artificial shark’s fin – thanks to the succulent strips of young coconut flesh that adorn their colourful and sweet icy concoction. The heap of finely shaved ice, drenched with rose syrup, fragrant gula Melaka syrup and evaporated milk consists of plump Green Giant corn kernels, home-made red bean mash, giant kidney beans, diced black grass jelly or cincau. Perfect for hot sweltering afternoons! This is one local salad that appeals even to non-vege eaters but it takes a good sauce to separate the wheat from the chaff. We have been getting our regular Indian rojak fix from this mobile van since we discovered it by chance earlier this year. For RM3.50 per plate, the mixed salad of chopped prawn fritters, deep-fried flour and coconut fritters, firm beancurd, shredded cucumber and sengkuang (jicama), and hard boiled egg smothered in a scrumptious sweet, nutty and spicy sauce will leave you clamouring for more. You can also get the guy to add on some spicy brown cuttlefish (at additional cost) for extra flavour and texture. Wash it all down with a bowl of ais cendol.